One of the most talked-about startups came out of the shadows this week, as The Venice Project revealed itself to the world as Joost. The company invited The Reg to its West End offices for a demonstration and a chat with CEO Fredrik de Wahl. 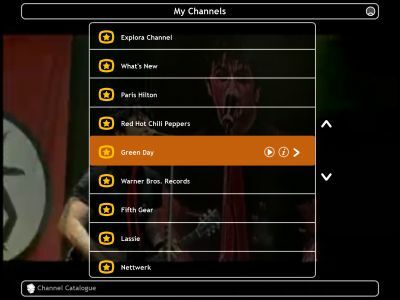 Joost is an interactive, IP-based TV software system from the people who brought you Kazaa and Skype, Niklas Zennström and Janus Friis, considerably richer after the $2.6bn purchase of the telephony start-up by eBay. The parallels with the founders' earlier projects are hard to miss. Joost is P2P PC software; it's free to download and use and requires no special hardware; it's based on proprietary software; and the technology is cooler than the business case. The most striking similarity, however, is that it challenges incumbents' delivery systems. What Kazaa did to music distribution and Skype did to telephony, Joost wants to do for TV. Only, this time round, Friis and Zennström are being a lot more co-operative with the incumbents. Around 25 of Joost's 150 or so staff (no skunkworks project, this) are in London, and the steady stream of visitors from media production companies signals that Joost's desire to partner from the get go. London is certainly the place to be if you want TV ideas, as it's the birthplace of so many new formats in recent years, giving the world (for better or worse) reality TV. Sorry, World. This is a shrewd move by Joost,and probably a necessity. TV is ultimately about watching something compelling, and compelling TV is made by people who know what they're doing. Despite the buzzword-heavy sales pitch - we heard the words "long tail" and "user empowerment" repeatedly - Joost needs TV production companies and aggregators. So what is it? Quite simply, Joost turns your PC into an instant, on-demand TV. No set top box is required. There's really three parts to the technology. Joost operates a server farm to cache the video, manage seeding, and maintain QoS, but the idea is that much of the content resides on people's own PCs. Like Bittorrent it takes advantage of your largely under-utilized uplink. The video is received over a proprietary DRM connection, using encryption of Joost's own devising. Thirdly, there's a Mozilla-based client, for advertisers to develop commercials or marketing tools, and software developers to create their on screen widgets. It comes with a chat client, but examples of Joost widgets include giving clips ratings, and noticeboards. Because it runs on a PC (Windows now, Mac and Linux to come) applications could include anything that's permitted to access the host's services. deWahl cited one example, custom remote control app for a phone, similar to Salling's splendid Clicker program. From the outset of our demo, it was clear Joost has cracked some fundamentals. TV runs instantly, full screen and at high quality - there's no lag from activating the TV software to getting something to watch. It runs in a window too, of course, but there's no messy furniture. And unlike Bill Gates' whacky vision of TV, it isn't a split screen with one half taken up by text ads. The on-screen widgets are discreet, alpha-blended overlays created using SVG and HTML. So right away, this is YouTube done properly. 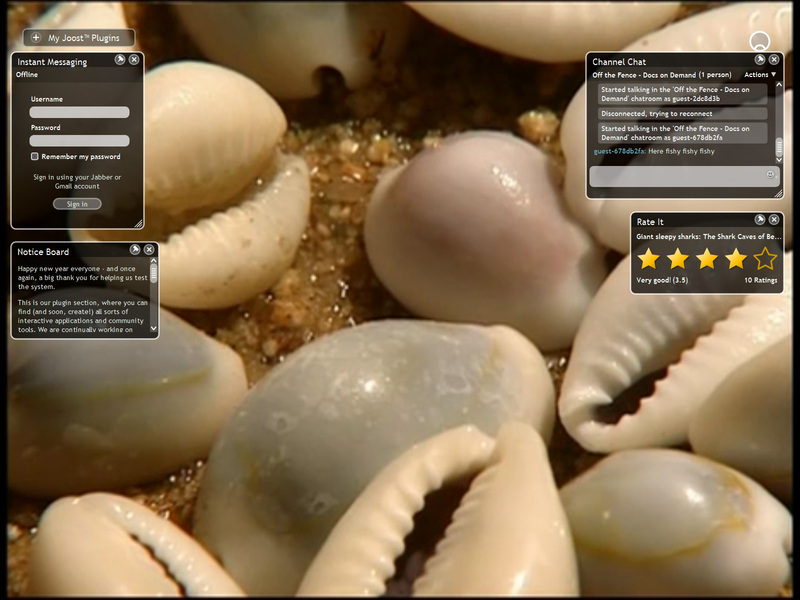 The chat widget takes us into familiar Interactive TV territory -you can rate clips, chat with friends, and so on. Joost has already been the subject of some concern, as most new budget broadband users in one of its launch markets, the UK, are capped. Joost uses a lot of bandwidth: a note on the company's website explains that an hour's TV downloads up to 320MB and uploads as much as 105MB. Joost's CEO Fredrik de Wahl told us the P2P effect, which diminishes bandwidth requirements, only really comes in at peak times, lowering the bandwidth requirement to 220MB an hour. Unless UK ISPs change their policies in response to demand, Joost will remain out of reach. (Joost tells us the bandwidth requirement is a 500kbit/s line - our demonstration was apparently running over WiMAX). Joost has already been criticized for failing to strike deals with major distributors. But it has already signed up Warner Music and production company Endemol for the beta, which isn't too shabby, and a good pointer to the future. Production houses such as Endemol stand most to benefit from Joost, as it gives them another route to market. Will it pay, however? For the established TV players, this is the big question. For Joost, it's a question of faith. For PC owners, it's a fairly straightforward win-win. Let's break it all down. Next page: Joost in time?